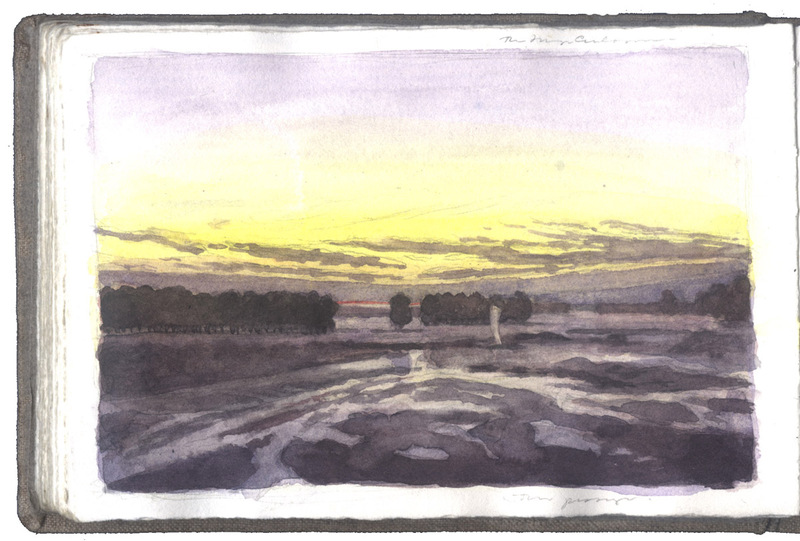 Charles Ritchie, Copy after The Large Enclosure by Caspar David Friedrich, watercolor and graphite on Arches paper in bound volume, page size: 4 x 6”. When I copy the work of other artists in my journal, I meditate on their art in a systematic, physical way and by doing so often discover passages I might otherwise miss. The art of Caspar David Friedrich, the great German 19th century Romantic, has long been a favorite of mine. I find works such as The Large Enclosure spellbinding. This sublime landscape is dominated by an arc of clouds sweeping down towards an upwards bowing waterway. As a little boat approaches the center, it appears to be squeezed in a convergence of earth and sky. Sinuous networks of clouds and waterways enhance the sense of constriction. As I made my copy, I noted a little opening between the trees that is just the shape of the boat’s sail; like an empty space calling to the piece of a puzzle that fills it. But I sense The Large Enclosure represents passage on other levels as well. The dark trees in the middle ground block our view, creating hidden space relieved by tantalizing vistas that stretch into open landscape. While sketching, I noted a subtler passage at the far right, deeper in the distance (see the detail on the right page of the sketchbook spread below). I had never before observed this second tree line, one that offers a solitary opening into a further realm. Perhaps this passage was a symbolic crux of the picture for Friedrich, whose Christian faith would offer a single path out of our earthly enclosure. No matter if I stand before the actual work of art or look at a reproduction, the act of copying leads me into mental and physical inquiry. I train my eye and hand to follow passages once charted by a master. By doing so, I spark personal meditations on the creative process and uncover pathways leading into unexpected levels of myself. Charles Ritchie, Sketches after Paintings by Caspar David Friedrich, two page spread from journal Book 130, watercolor and graphite on Arches paper in bound volume, page size: 4 x 6”. Six sketchbooks are now on view at Gallery Joe, Philadelphia, Pennsylvania until 20 December 2008. * With the advent of Modernism in the late 19th century, painting was no longer restricted to being an imaginary window depicting another world. Paintings could be appreciated for their physical qualities alone, beyond convincing illusionism.